Beautiful villa with delightful lawned gardens and large private swimming pool. 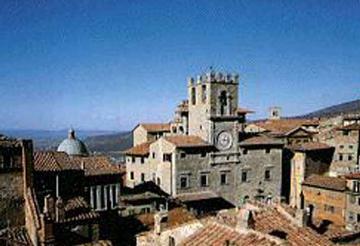 Set at the foot of the hills near the fabulous city of Cortona. Local shops 300 metres. Tennis 2km. Riding 7km. Golf 10km. The upper floor has four double bedrooms (1 x 140cm wide bed in each) and two bathrooms with shower. An extra bed can be added to a bedroom on request. The ground floor has a fully equipped kitchen with open fireplace and a vast living and dining room, with a large fireplace, overlooking the pool area. Triple bedroom (1 x 140cm wide bed) and 1 x 90cm wide bed) and a bathroom with shower. The villa is well furnished and comfortable. Property made available in good order and fully equipped. Reasonable consumption of services including water, gas and electricity. Linen and towels (not beach towels) provided. Garden and swimming pool maintenance. Saturday arrival 15.00 to 19.00, depart before 10.00. Pool open from 01/04 to 07/10/17. Refundable deposit 250€ payable locally. Obligatory final clean 120€ paid locally. House heating 1,80€ per litre. Pets supplement 35€ per animal per week. Tourist tax € 2 per person per day, applied for the first 4 days only. Children up to 12 years do not pay.